The Revolution Ends?! S2 Finale Recap!! High School Martial Arts Web-Series ‘Fighter’s High’ from Philly WANTS YOU! Super Bounty J1 Secret Missions 2: Page 3…. SHARK!!!!! 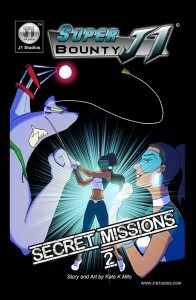 Last time in Super Bounty J1 Secret Missions 2: J1 had tracked down her bounty, Jammerhead the Hammerhead, an escaped genetic experiment from the DNA sea side laboratories. With the help of her cohorts, Master Chin and the Pandito brothers, J1 had gotten Jammerhead to chomp down on a tasty ice cream cone…that was attached to her fishing line! Is it really gonna be so easy to catch this bounty folks? Check out the newest page of Super Bounty J1!